We recent paid a visit to Chuck's parents home in Pennsylvania and stopped at their local farmers market. We found a beautiful eggplant (for $1 - can you believe it?) and brought it home for a hearty Italian supper. I know it's summer and we should have grilled it, but we hadn't cooked an Italian meal in awhile and figured the eggplant was big enough to do some serious damage. This is a really simple dish and is great for a dinner party. 1. Slice eggplant into ¼” thick discs. Pour ½” oil in a large pan and heat over medium heat. Heat the oven to 350 degrees Fahrenheit. Heat sauce in a pan over low heat. 2. Coat eggplant in the following order: flour (shake off the excess), dip in egg batter, cover with breadcrumbs. 3. Fry eggplant for approximately 2 minutes on each side, or until light golden brown. Set each fried piece of eggplant aside on a tray covered with paper towels. *Note: The oil is ready if it quickly begins bubbling around the eggplant when it enters the oil. **If you are opposed to frying your eggplant, you can also bake it on a cookie sheet at 350 degrees Fahrenheit for 5-8 minutes on each side, until golden brown. 4. Pour a thin layer of sauce in a glass baking dish. 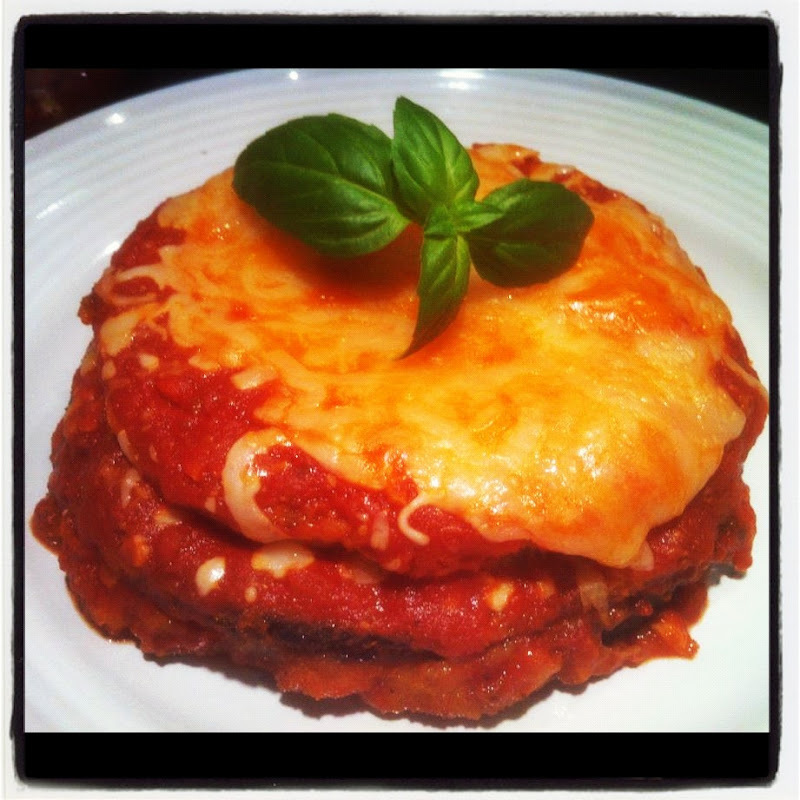 Place the bottom layer of eggplant discs over the sauce, leaving space between each disc. Cover the bottom layer with another layer of sauce, and sprinkle with both the Parmesan and mozzarella cheese. Repeat eggplant, sauce, and cheese until you have a single serving stack (3-4 layers of eggplant), making the cheese your top layer. 5. Bake in the oven for approximately 15 minutes, or until the cheese melts. Serve each stack with a side of pasta and leftover sauce. Garnish with basil.